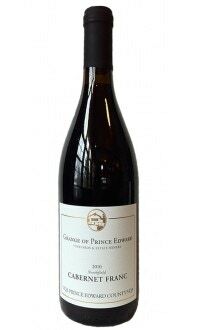 Sorry, Grange of Prince Edward does not ship wine to United States. 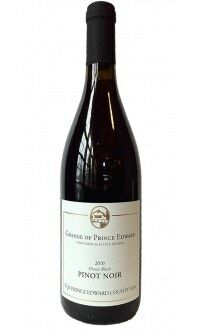 Wine Profile: Ruby red color with garnet tones Aromas of raspberry and herbal undertones. Palate has a savory fruit core with bright herb tinged notes rounding out the finish. Good acidity and structure. Winemaking: Harvested September 24th to 26th at an average of 23 brix. Fermented in stainless steel, 28-day primary fermentation for extended maceration. Aged 24 months in neutral French oak barriques prior to bottling. Vineyard: A temperate microclimate covers the region of Prince Edward County. It is also geographically distinct; the island lies on a bed of limestone gravel with fractured bedrock that was deposited on the edge of the Canadian Shield. The result is the perfect combination of climate and geography for growing vinifera grapes. Our 600-acre farm (60 acres under vine) is 5 km inland in the Hillier region making us a hotbed in Prince Edward County standards. The block containing our Pinot Noir was planted in 2001 and 2002, with clones 115, 667 and 777. Located on a site with southern exposures, and soils averaging a depth of 12-24”. A juicy and generous PEC Pinot Noir with lovely aromas of sour cherry and cranberry. Lots of acidity on the palate. Long finish.